Images from the first-ever Dutch King's Day in honour of King Willem-Alexander, crowned last year after 122 years of queens on the throne. 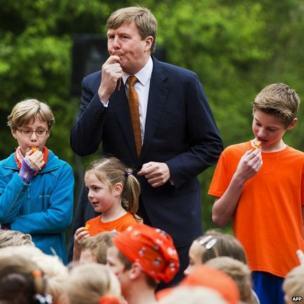 For the first time, the Netherlands is celebrating King's Day, the birthday of King Willem-Alexander (L), who acceded to the throne last year. 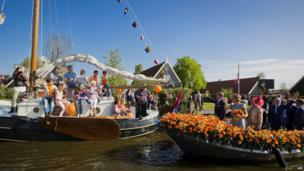 For the past 122 years, the holiday had always been Queen's Day. 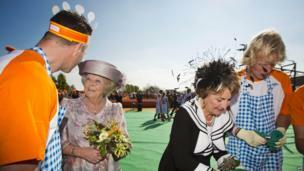 But with the abdication of Queen (now Princess) Beatrix (L) last year, the Dutch now have a male monarch. The king himself blew the whistle to start the King's Games on Friday in Utrecht, part of the celebrations. The main focus on Saturday has been the fishing town of De Rijp, in the north-west of the Netherlands, where well-wishers turned out to greet the royal family. The king and queen took part in a parade where orange featured heavily - the colour of the royal house. 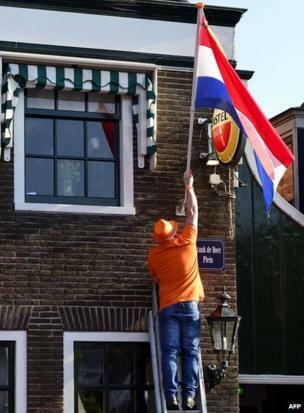 Residents of De Rijp hung out flags to welcome the king and queen. 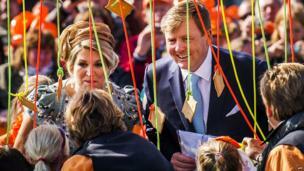 The king and his wife, Queen Maxima, played tennis in De Rijp as confetti rained down around them. The monarchy is popular with the Dutch, although some question the cost.